Shade is the gardener’s perpetual problem – just what can I grow in those inevitable shady spots that are found in every garden. Beneath trees or in the shade of buildings, it is almost impossible to have a garden without shade – either from the beginning, or gradually developing as your trees and taller shrubs grow and mature. Gardener’s can be stubborn, and all too often we see gardens where sun-loving plants struggle to survive, rarely or never flowering, and adding a miserable inch or two of growth each year – if you are lucky. If this sounds like you, then the best advice is to re-think the problem, and grow plants that have developed over the millennia to thrive, not suffer, in shady places. Let nature be our guide to easy gardening, and to solving the perpetual ‘shade problem’. In Europe, gardeners rely on spreading forms of the yew tree for their shady areas. 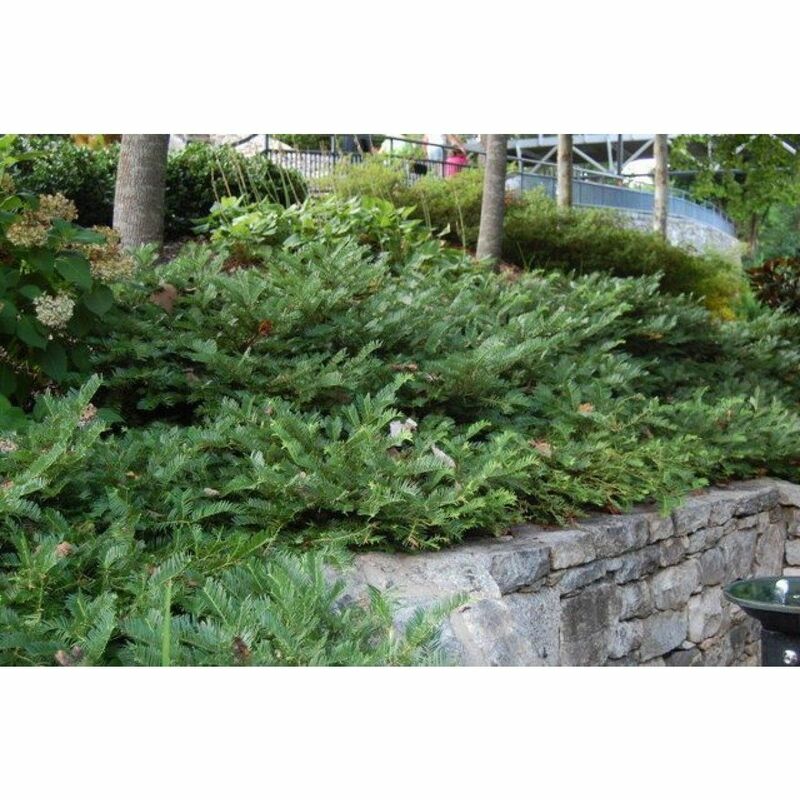 This soft-leaved evergreen grows naturally beneath large forest trees, and it is happy in shade. It can be clipped and trimmed as needed, and its rich coloring is perfect to fill the lower levels of a garden, completing the picture. When brought to North America the yew tree proved valuable in areas that were not too cold, and with the help of the more cold-hardy Japanese yew, northern gardeners have a good selection of yew trees to solve most of their shade problems. Southern gardeners were not so lucky, as the European and Japanese yews like cooler conditions, and the heat and humidity of the South is often just too much for them. Strangely, alongside the Japanese Yew, growing in the southern islands of Japan, there is another, very similar-looking plant that has been passed by. This plant, called the Plum Yew, is hardly known, and rarely planted, yet it thrives in the South and grows in shade. How often in life is the solution right there, if we take a fresh look around? What Is a Plum Yew Tree? The Plum Yew is a broad, upright evergreen, closely resembling a yew tree, but with longer, narrower leaves, up to 2 inches long, arranged in two rows along the sides of the stems. They arch upwards slightly, and they are often compared to the wings of a dove because of the ‘V-shape’ they form. The plant can eventually rise to become a small tree, up to 20 feet tall and wide. Although looking like a yew tree, it does not have the bright-red berries often seen on those plants in fall. Instead it has larger plum-like fruits, about one inch long. These are pale green with darker green stripes when young, and they then turn brown as they mature. The fruit is not edible, but it is rarely seen in gardens, because, like yew trees, the Plum Yew has separate male and female trees, and most garden varieties are male. This makes the tree safer to grow around small children, who can find the red berries of the true yew tree fatally tempting. The Plum Yew will just about grow in zone 5, with some winter burning, but in warmer zones, from 6 to 9, it really comes into its own. If you garden in hot areas, like the South, then this truly is the plant you need for those shady spots. Unlike the true yew trees, it is happy in heat and humidity, and it is also more drought resistant than any yew tree (once established). It grows best in well-drained soil, with plenty of added organic material, and when young it should be watered regularly during hot weather, to become well-established. It almost never has any pests or diseases, and deer usually ignore it. For a low-maintenance plant it can hardly be beaten, which is good news for busy gardeners. The other wonderful thing about the Plum Yew is that like other yews it can be trimmed into shape, to make hedges, or to simply keep it confined to a particular space. As well, if it should become too large, it can be cut back hard, into old wood, unlike most other evergreens. This means you can ignore it for years, and then do a big ‘tidy-up’ if needed, and your plants will bounce back, totally rejuvenated. In gardens the wild form of this plant is rarely grown, because of its large size. Instead there are two commonly available forms you should be able to find without too much trouble. The most important of these is a spreading variety called ‘Duke Gardens’. This plant was found in 1958 by Richard Fillmore, the Head Horticulturist at the Sarah P. Duke Gardens, part of Duke University, in Durham, North Carolina. 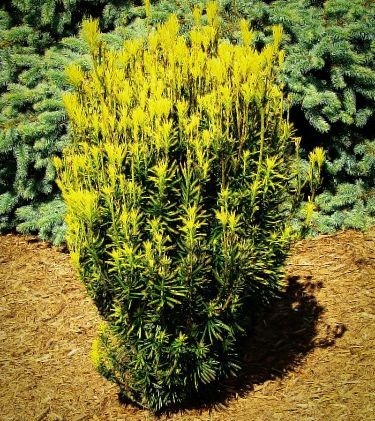 More useful because it is smaller, it spreads widely to become a plant about 4 feet tall, and about 6 feet wide, so just a few plants will cover a large shady area with attractive foliage all year round. In time, unless trimmed, it will grow several feet more in both directions. This is a male plant, so no fruit is produced. It can be trimmed as a hedge, or just for generally neatness, or left to grow naturally into a dense, spreading shrub. The other common form is a dense, narrow, upright form called ‘Fastigiata’, which originated in old Japanese gardens. It has very upright stems, and a more irregular base. If you want a narrower accent in a shady spot, this is a good choice, but because it is not wide-spreading it is less useful for filling large shady areas than ‘Duke Gardens’. Where Did the Plum Yew Come From? It seems that the very resemblance of the Plum Yew to other yew trees is why it is not as widely grown as it should be. After all, it is not as if the Plum Yew is a new find. It was found growing on the forest floor in Japan by early European collectors, and it was brought to Europe in 1829. Perhaps its close resemblance to the yew tree meant it was overlooked, and indeed it was, in 1839, officially named as a type of yew. The error was soon corrected, and a certain Earl of Harrington grew it and was the first to promote its use. He had the honor of having it named after him, as Cephalotaxus harringtonii. Perhaps that mouthful of a name is also part of the reason for the lack of interest in this plant, but really, if you live in warmer areas, this substitute for the yew tree should be in your garden. You will love it. Even in areas where yew trees do grow well, it is sufficiently different in appearance to be worth growing for variety and interest. So don’t overlook the Plum Yew. You won’t regret the day you planted your first one – it won’t be the last.